I love having Mondays off, because the rest of the week seems to go by so quickly! I can’t believe tomorrow is already Wednesday! Also, I feel like my students are really getting a hang of our routines and procedures, which is always exciting! We start out our grammar unit by talking about types of sentences and punctuation marks, and of course, Pinterest has tons of wonderful ideas to go along with it! I saw this pin which fit perfectly with what we were doing and was super easy to do with my kiddos! We had already discussed the different types and done some practice with them, so this was more of a fun review to check for understanding and challenge them to think creatively! I had the (empty) chart up on the board, and each student got 4 different colored post-it notes. I wrote down which color corresponded to which type of sentence on the board for them to refer to. Then they worked with their team to come up with unique examples of each type of sentence. I loved what they came up with! Love the sticky note idea! I might have to borrow that one! Love the post it note idea! I just might have to adapt that for my first graders. I'm so jealous you have an ipad. I want one so bad. I keep hinting to my husband that I want one for Christmas. Cute shoes and I am SO jealous of your personal laminator! Good luck on going back to school!! So glad to have found your blog through the Currently! I love my laminator, too!! It is the best! Thanks for sharing the super easy types of sentences chart. We are reviewing types of sentences tomorrow and I am so using the idea! I am so very jealous of your new laminator, I got to play with a really nice one of my moms yesterday and I am now convinced I NEED one 😉 lol ok want…but its almost a need hahah!! First let me say I love the post it idea. I'll definitely be borrowing that for next year. Secondly, I am so jealous about your laminator. I went to Costco this weekend looking to buy the Purple Cow laminator I had seen the week before . Well you can imagine my sadness when I could not find it. I was devastated . 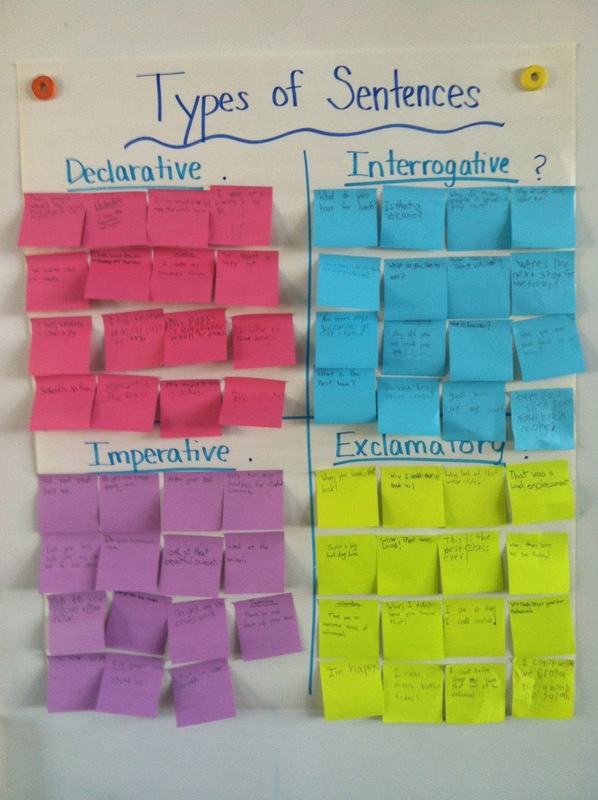 Adorable idea for the different types of sentences and coordinating post-its. I am working on/reviewing types of sentences with my 6th graders this week. I am "borrowing" that idea! Love the Types of Sentences Poster! Gonna do that on Monday! Thanks for sharing. I love your types of sentences anchor chart. We will be doing that soon! BTW – You might already have one, but I am hosting a giveaway on my blog. You could win a free, personal laminator. Come check it out when you get a chance. LOVE this idea and can pair w/ quotation mark practice, too!